There is no shortage of logos in the world, no dearth of brands striving for consumer allegiance and no chance that the creation of new brands and logos will cease. In fact there’s an interesting subset of brands and logos that don’t bother with what seems like a crucial component: an actual product, service or company. Consider the Weyland-Yutani Corporation. It’s part of the fictional universe depicted in the 1979 film “Alien” and its sequels; Nostromo, the spaceship freighter in the first movie, is a Weyland-Yutani vessel. The company doesn’t do much in the way of branding in, you know, reality. But as it turns out, it’s possible to buy yourself a Weyland-Yutani T-shirt, or even a Nostromo T. It also turns out many people have. “I’ve always had a lot of T-shirts,” he says, “and loved any kind of travel T-shirt, like a souvenir.” He also liked band shirts and even designed the logo for the one he was in — a punk group called Consumed, as it happens — which put out several records and toured the U.S. before breaking up a few years ago. “It was sort of a natural progression,” Ford says, to make souvenir shirts of places and things that exist only in fiction — and that act as a subtle tribute to a film or book. 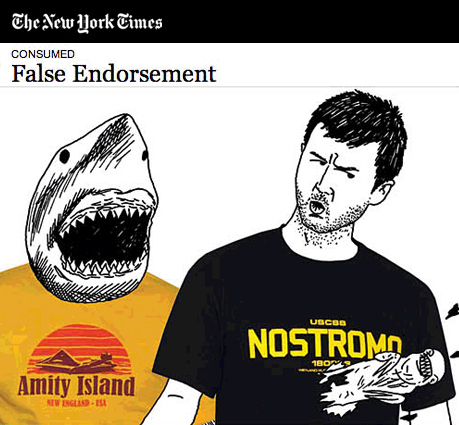 After all, only a true fan would be attentive enough to the fake brand’s imaginary world to pick up on the reference. Fictional-brand fandom has real precedence. Last year the online store 80sTees.com named Duff beer, from “The Simpsons,” the No. 1 fake brand — beating out T-shirts for Dunder Mifflin, the paper company on “The Office.” Promotions for “The Simpsons Movie” took the notion to its logical extreme, concocting actual products to be sold under imaginary brand names, like Buzz Cola, Frosted Krusty-O’s and so on, at certain 7-Eleven locations that were made over into outposts of the show’s Kwik-E-Mart chain. They sold briskly and still trade hands on eBay. Other real fake brands have attained a more permanent status. Bertie Bott’s Every Flavor Beans began in Harry Potter books and moved to actual retail shelves; “Forrest Gump” spun off an actual restaurant chain, Bubba Gump Shrimp Company; and Nestlé sells candy under the Wonka (as in Willy) name. An article in The Harvard Business Review last year mulled “reverse product placement” as a strategy for starting new brands, pointing to the imaginary Sprunk brand of soda in the game Grand Theft Auto as a possible candidate. There’s little chance of this happening with Last Exit to Nowhere: Surely it’s not worth the effort to make actual replicants just to capitalize on the Tyrell name. Also, the intellectual-property issues involved are a bit weedy. (Though Ford has yet to hear from any of the creators of the movies that have inspired his T-shirts — he figures he’s helping keep the films fresh in consumers’ minds. He adds, helpfully, that he would be happy to work out a deal or stop selling any particular item if he is “stepping on anyone’s toes.”) Finally, fake brands — the parodic Simpsons products, Mooby’s in Kevin Smith movies, Big Kahuna burgers in “Pulp Fiction,” etc. — tend to be appealing partly because they are fake and often encompass a kind of critique of the absurdity of branding itself. Souvenir T-shirts for places and things that don’t actually exist play off this by simultaneously endorsing something and smirking at the idea of wearable endorsement. Ford, in fact, describes himself as, “not one who sports logos, advertising on your clothes for Nike and Reebok and all that.” That’s why, after his first couple of hundred shirts, he realized it was a mistake to have even a small Last Exit to Nowhere logo on the back. “It was taking away something from the mystery of it,” he says. Now, he says, the T-shirts are “totally unbranded.” Sort of.